Rob Shirkey is a recognized global authority on the subject of climate change warnings on gas pump nozzles. He has given lectures on the topic across North America and has been featured in media all over the world. After interviewing Rob, DeSmog Canada wrote: “Shirkey speaks at breakneck pace with a lawyer’s clarity and the energy of a children’s entertainer.” Click here to see what people are saying about Rob and our project. Rob has given talks to faculty and students at the University of Toronto, Stanford Law School, Ryerson University, McMaster University, the University of Guelph, the University of Waterloo, Queen’s University Law School, University of Ottawa’s Faculty of Law, Osgoode Hall Law School, University of Victoria Law, University of British Columbia, Simon Fraser University, University of McGill, Concordia University, and Dalhousie University. Rob has also done talks for the Centre for Social Innovation, Me to We, the Council of Canadians, Earth Day Canada, the Global Change Initiative, the Institute for Research and Innovation in Sustainability, Citizens Climate Lobby Canada, the Greater Toronto Area Clean Air Council, the Toronto Climate Action Network, Transition Towns, Guelph’s Annual Environmental Sciences Symposium, and numerous community organizations. 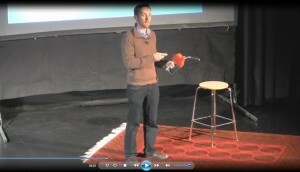 He has also done many radio interviews and was invited to a TEDx conference in late 2013. 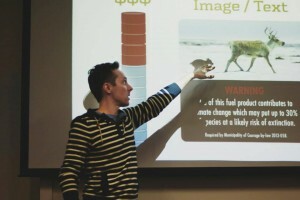 Rob’s talks draw on climate change research from numerous international organizations. 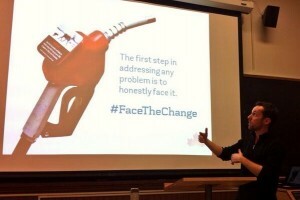 He gathers insights from psychology, sociology, economic theory, behavioural economics, business, law and municipal politics to build the case for demand-side, local action on climate change. His trial experience as a lawyer and his playful sense of humour makes him a compelling and entertaining speaker. Contact us at communications@ourhorizon.org to book him for your event. 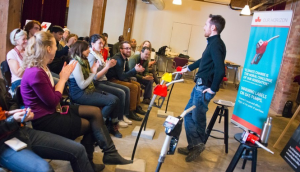 Want to book a fun, hands-on workshop with real world implications? Rob, our staff, and volunteers have done presentations at elementary schools and high schools across Canada. Students appreciate the opportunity to express their climate change concerns by creating their own warning labels and are excited to know that we share their creations with their elected representatives. As students design their labels, we tell them about our plans and encourage them to contact their representatives. We also invite them to join us at city hall to give short speeches called “deputations” when our idea is debated by councillors. Even if students aren’t old enough to vote, they are still welcome to express their opinions to local government. In addition to acting on their concerns about climate change, getting involved in our project also gives students insight into how their own communities are governed. The experience builds self-confidence, public presentation skills, and helps to encourage further community and civic engagement. Unlike many climate change presentations (which, quite frankly, can be real downers), students come out of our workshops feeling empowered and eager to use their voices to shape their communities and change the world. Email us at communications@ourhorizon.org to book a workshop or learn more. 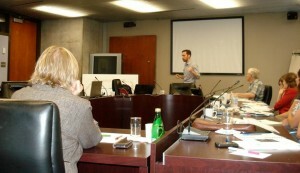 Presentations to Councillors and Staff. While our idea appears simple, there is a lot of research behind it that makes it a very compelling proposal. And while perhaps not immediately obvious, the legal arguments behind our by-law are equally persuasive. Please read our Report for Councillors and Staff for more information. 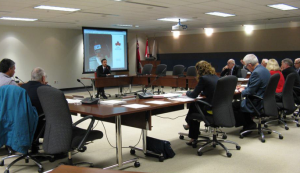 We encourage staff to invite us to offer a presentation to ensure their councillors have access to full and relevant information during the course of their deliberations. Please contact us at communications@ourhorizon.org to arrange a complimentary presentation.